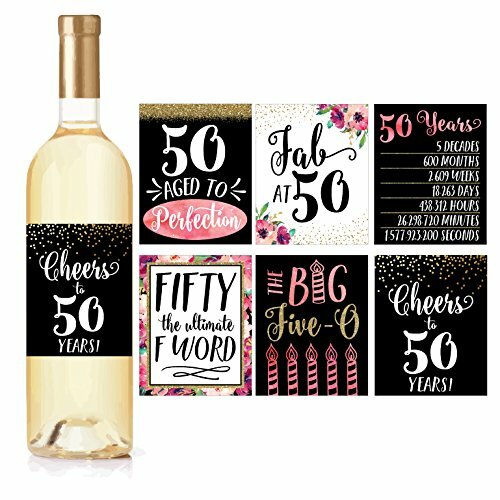 Why should you order 50th birthday wine bottle labels? BONUS - 6 Different Birthday Milestones! Our wine bottle labels are the perfect addition to your birthday party decorations and supplies, great gift for women, mom, wife, friend girls & more! With Pink Gold and Black colors! SHARE PRICELESS MEMORIES WITH FAMILY & FRIENDS: Use these wine bottle labels as decor at the birthday party! Everyone will love the funny sayings! It will be the top talking point of the whole party! DELIGHT BIRTHDAY GIRL AT THE PARTY: Leave the boring coffee mugs and shirts to other guests and give the gift they'll laugh and remember for years to come! Everyone will be able to relate to each sticker!